We are proud to announce that the prestigious, Real Centro Universitario “Maria Cristina,” an affiliate of the renown Universidad Complutense de Madrid, has signed a Collaboration Agreement with Interpreter Translation and granted Academic Approval for the Spain 2019 Interpreter Training Program! 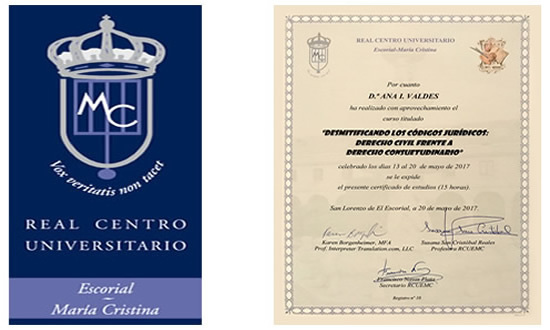 In 2019, our courses will be held at RCU “Maria Cristina.” Upon completion, this Spanish university will issue its official “Certificado de Estudios” to each participant. Join us for an awesome Interpreter Training experience near Madrid, Spain, the country that brought the Spanish language to the Americas! Enhance your interpreting skills in the cradle of the Spanish language! Visiting the “Mother Land” is the perfect way to improve your interpreting skills. You’ll benefit from intense practice, and you’ll add new dimensions to your Translation and Interpreting skills with an in-depth study of the parallels between the Spanish Civil Law System and its implication on US Common Law. This 8-day adventure to Madrid and the surrounding area is tailored for the professional Spanish interpreter. All courses are pending approval for Continuing Education Credit through several State Courts and will qualify for credit in most Consortium Member States throughout the USA. Nestled in the Guadarrama Mountains just 45 kilometers (28 miles) northwest of Madrid is the small town of San Lorenzo de El Escorial, home of the Monastery of San Lorenzo, an amazing feat of 16th Century architecture built by King Phillip II. This complex is considered by many to be the 8th wonder of the world. King Phillip II envisioned El Escorial as an educational center, and today San Lorenzo de El Escorial is home to the private university, the Real Centro Universitario “María Cristina,” professional conference centers and meeting rooms at the Hotel Florida and EuroForum along with numerous public and private schools. In keeping with this long tradition of educational excellence, it is fitting that Interpreter Translation hold its 4th Annual Interpreter Training Program in San Lorenzo de El Escorial.